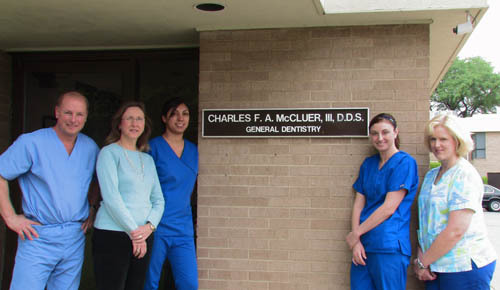 Dr. Charles McCluer has been a Fort Worth resident since his childhood, and has been practicing dentistry in the Fort Worth area for over 20 years. Our office provides a wide range of dental services for both children and adults, from orthodontics to root canals, from bonding to veneers and many more dental procedures. Conscious sedation medications such as nitrous oxide are available for patients who need them for better comfort during a procedure. We do our best to make dental procedures as pleasant and painless as possible for our patients! We offer not just orthodontics and oral surgery that give you a healthier mouth and lay the foundation for a great smile, but also plenty of cosmetic dentistry services that give you the most beautiful smile possible. Whether you need bonding, teeth whitening or veneers, Dr. McCluer can help your teeth look their best. And that can boost your confidence – even helping you achieve more professionally and do better socially. There’s no telling where a brighter smile might take you! Whether it’s dental implants or dental bonding you need, or tooth extraction, dental bridges or crowns, Dr. McCluer has the right solution for you. Whatever dental services you receive from Dr. McCluer, you can rest assured that our office is committed to providing the highest level of care and ongoing commitment to your dental health. Dr. McCluer's goal is to provide the best range of dental services available while offering a patient-focused experience. We’re here to offer dental care and cosmetic dentistry services to Fort Worth patients in as easy and painless a way as possible. To set up an appointment, please call (817) 731-2661. And to shave some time off your office visit, you can fill out the necessary forms available on this website.